An obsessively accurate emulation of API’s flagship compressor. The API 2500 Bus Compressor is a permanent fixture on the stereo bus of many of the world's top engineers and producers. Considered the best of the Paul Wolff-era API circuit designs, this famed compressor adds energy, movement, and tone to stereo mixes and subgroups unlike any other compressor. The API 2500 Bus Compressor plug-in for UAD-2 hardware and Apollo interfaces is a spot-on emulation of this classic compressor, capturing its all-discrete signal path with Thrust® circuitry — and features a fanatically detailed modeling of API's custom transformers and 2510 and 2520 op amps. Learn how to use the API 2500 on drums, bass, guitars, and your entire mix. Poring over proprietary "for-your-eyes-only" schematics made available to Universal Audio by API, our team of DSP experts analyzed two classic API 2500s — rackmount and in-console — ensuring one of UA's tightest behavioral circuit models to date. Working together with API's engineers, we scrutinized every facet of the plug-in against its analog counterpart, delivering the definitive representation of this iconic compressor. Early beta testing with UA artists confirmed that the plug-in ranks among the most accurate analog emulations in UA history. API designed the 2500 compressor with program material firmly in mind. Its Release control includes fixed or variable options, while the Attack, Threshold, and Ratio controls offer musical tweaking throughout their range, making the API 2500 a toneful dynamics overlord for your stereo bus. The API 2500 allows selection between three custom-voiced compression Knees — Soft, Medium, and Hard. You can shape the tone further with two compression types; "Old" for characterful peak-detection harkening back to API's earliest, highly-coveted 525, or "New", which features a modern feed-forward design. Taken from their Paragon series of consoles, the API 2500’s Thrust feature puts a filter before the RMS detector, evening high and low frequency energy — so neither triggers the compressor more than the other. This gives you a tight hallmark API punch beyond any other compressor. Most compressors only allow you to turn left/right linking on or off. 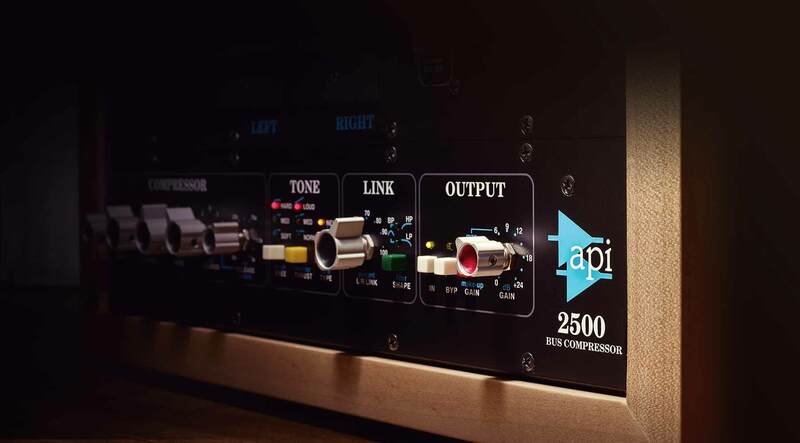 The API 2500 Bus Compressor Link parameters allow for precision control of your mix's L/R dynamic interaction. Set exactly how much dependence — or independence — you want your L/R spatial dynamics field to have, and hone your dynamic contours even further with the Shape control. Awesome compressor, I'm loving the old style colors nice my techno kicks. thank you so much for doing such a great job emulating this modern classic. it really does add depth to your mix just like the hardware. Not quite found the perfect setting yet but just getting started. I can feel the power in this plug in. No regrets but much tweaking to do. This was the first plugin i used that made me instatly feel using analog gear. Not always the first choice because of the colouration and special behaviour, but the smack it makes is sweet and predictable. In this case it is of no importance if it emulates the hardware perfectly or not, it simply works well. Perfect for drums. An excellent compressor, classic API sound...I love it! I have put it on My Master Bus and used the glue setting And teeked the volume a little to taste and it worked better than gorilla Glue..and made my Mix Come Alive.